An everyday book for American housekeepers, giving the most acceptable etiquette for American hospitality, and comprehensive and minute directions for marketing, carving, and general table-service; together with suggestions for the diet of children and the sick. Author of “The Cooking-School Text-Book and Housekeeper’s Guide,” “The Cooking Manual,” “Meals for the Million,” “Fifteen and Twenty-five Cent Dinners,” “Diet for Invalids and Children,” “The Workingman’s Dietary,” “Local American Cookery,” “The Baltimore Cooking Recipes,” Etc. Note: Miss Juliet Corson was the Superintendent of the New York School of Cookery on Union Square in 1878. The book was written as a challenge in response to an assertion made by Hon. John Eaton, Commissioner of Education, who did not believe that American cooking could be as wholesome, palatable, or nutritious as that of our Continental counterparts. Total page count = 628. Miss Corson certainly took this challenge seriously – an impressive woman with passion and conviction! 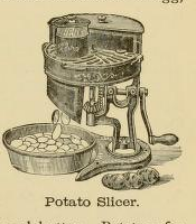 Source: Miss Corson’s Practical American Cookery and Household Management, Miss Juliet Corson, 1886. That was interesting. The cookbook was a little slow downloading but I looked through about half of it. I got an idea for a omelet. My pleasure! It’s a wonderful glimpse back in time to see what an educated, driven woman was doing with her life – certainly an inspiration given her gender constraints! More from this book is coming!